One of the most rare of the heritage breed of hogs is the Large Black Hog. Heritage breeds are bred for taste, hardiness, mothering ability, efficiency and perfected by farmers for more than a century. Once the most popular pig in Europe, the Large Black Hog is listed by the American Livestock Breeds Conservancy as endangered with fewer than 300 breeding hogs registered today. 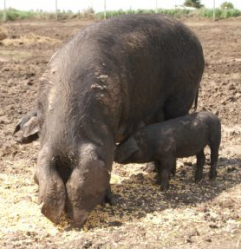 The Large Black Hog is a grazing pig and a mature dry sow can meet most of her nutritional demands on good pasture producing a better tasting healthier pork than a hog raised strictly on grain. Compared to other breeds, the flavor of the Large Black Hog’s meat is exceptional. The lean, micro-marbled meat is extra tender due to the breed’s short muscle fibers. 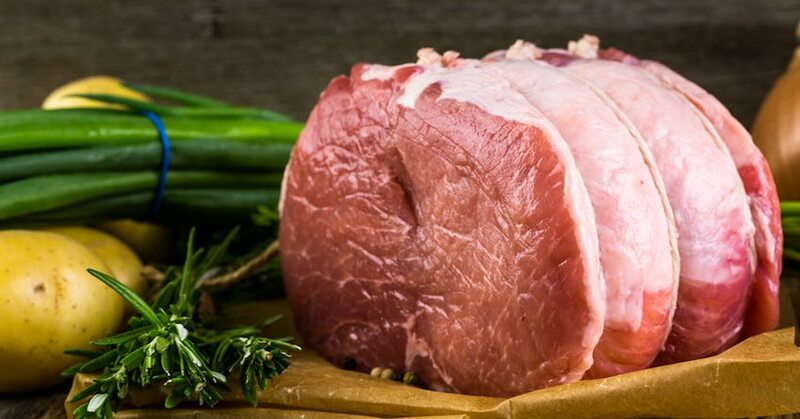 This produces a tender, moist cut of pork with an exquisite & unique taste. 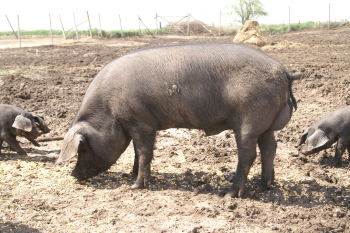 “The Large Black was developed from the black pigs of Devon and Cornwall and the European pigs found in East Anglia. The pigs of East Anglia were believed to have developed primarily from Chinese breeds brought into England in the late 1800’s. Conversely, the breeds of Devon and Cornwall were most heavily influenced by European breeds, primarily those from France. After 1900, the Large Black became well-known outside of its native region and spread throughout Great Britain. In the early part of this century the Large Black were used for the production of pork in outdoor operations. Its coat color makes it tolerant of many sun born illnesses and its hardiness and grazing ability make it an efficient meat producer. Large Blacks are also known for their mothering ability, milk capacity and prolificacy. 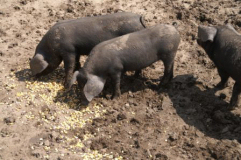 Early selection was toward the bacon type and now the breed is characterized by great length and depth of body. In 1899, a breed society was formed, so the breed can be considered as having been formed on or before that date. Formerly fed to enormous weights to produce carcasses with a large amount of fat, Large Blacks are now used for lean pork and bacon production. In England, they were often crossed with Large White and Middle White breeds. There were a few Canadian imports of Large Blacks in the 1920’s, but the breed was never very numerous in North America. A 1985 importation to the U.S. was made by Ag-World Exports, which felt that the ability of the Large Black to be productive in rough conditions would make it an economically attractive breed for U.S. farmers. The Large Black, quite distantly related to modern U.S. breeds, would also be useful in crossbreeding for increased hybrid vigor. 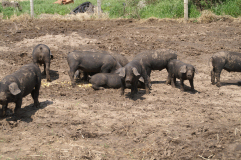 There was a further importation of Large Black pigs to Cabbage Hill Farm, NY in 1998. Large Blacks are large, just slightly smaller than Yorkshires, and always black. They have long heads and straight faces, with lop ears. Large Blacks have a good depth of body, fair length, and strong backs. The hair is fine and rather thick with the black pigmentation being quite heavy. The heavy drooped ear is also a characteristic of the breed. In fact, the ears are so large they cover much of the face and seem to obstruct the view from the eyes. The breed is known for its very docile nature, and some have suggested that its obstructed vision contributes to its non-aggressive temperament. Whatever the cause, they seem to move more slowly and deliberately than other breeds. The breed is said to have high levels of hardiness and thriftiness, with light shoulders, and good sides and hams. While the mothering ability and litter size are good, the breed does not seem to be as early maturing as most other breeds. The heavy black pigmentation of the skin is a characteristic not favored by processors. Information provided from The American Livestock Breeds Conservancy, Box 477, Pittsboro, NC 27312.